The yogitoes Earth Collection takes it's inspiration from the 18th century paintings of Shiva. Here, rich, matte hues and accents of matte gold reflect the colors of the Punjabi hills of the Rajput kingdoms of northwestern India. The Earth Collection features our patented silicone dot Skidless technology that grips your mat and prevents slipping no matter how much you move or sweat. 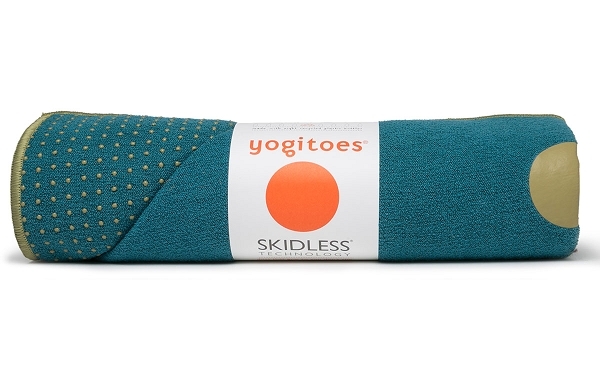 yogitoes' Earth Collection towels provide a comfortable, absorbent, stable and hygienic layer between you and your mat and are made from no fewer than 8 recycled plastic bottles - over 50% recycled fiber content. yogitoes' Earth Collection towels use AZO, lead, and heavy metal free dyes to protect our workers, our customers, and our environment. Explore new realms with yogitoes' high-performance, non-slip, and supremely sustainable Earth Collection towels, only from Manduka. Best towel I've purchased when I'm in a hot yoga class or just meditating. I love the super soft fabric.